Good morning and welcome to our monthly furniture themed makeover day. The theme this month is Pottery Barn Knock Off furniture. The gradient distressing on the console is just different enough…..I love it. You guys know how I love distressing anything. I distress the JTS quite often. 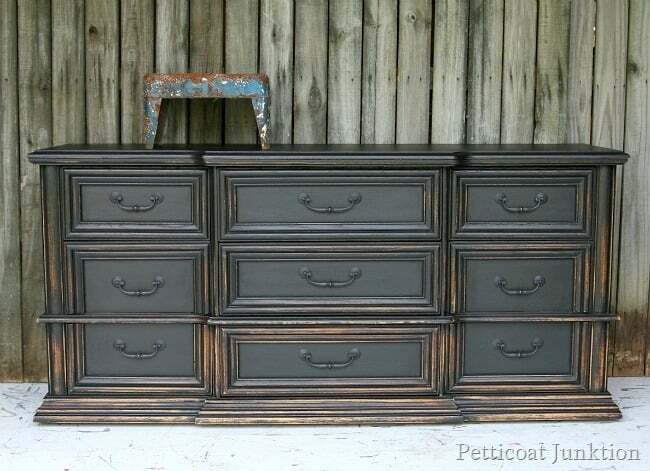 The dresser came from my favorite junk shop. A steal at $65. Prepping the furniture for painting is the biggest part of the makeover process. Here I have removed the hardware and taped the back side of the screw holes so paint doesn’t leak into the drawer. 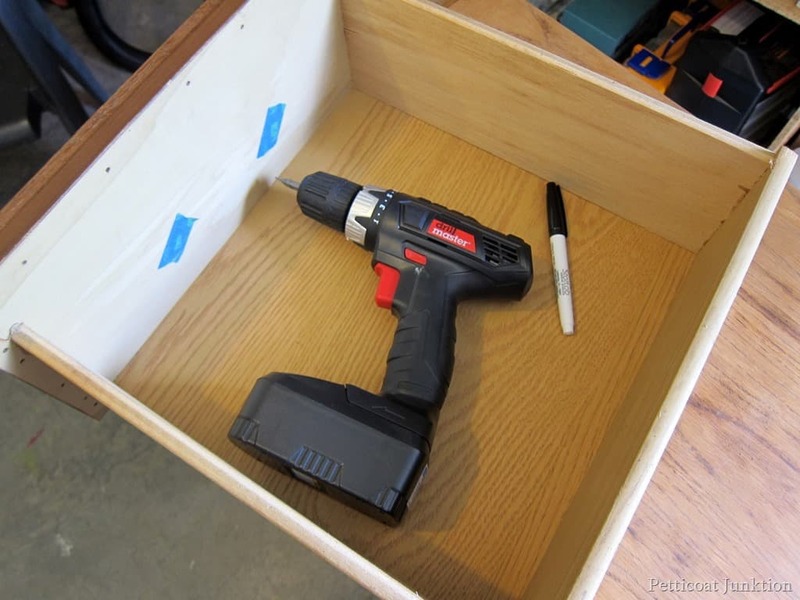 The permanent marker is for marking the back of the drawer. I always mark the back of the drawer according to the slot it goes into on the furniture. It’s a simple step and it makes my life so much easier. 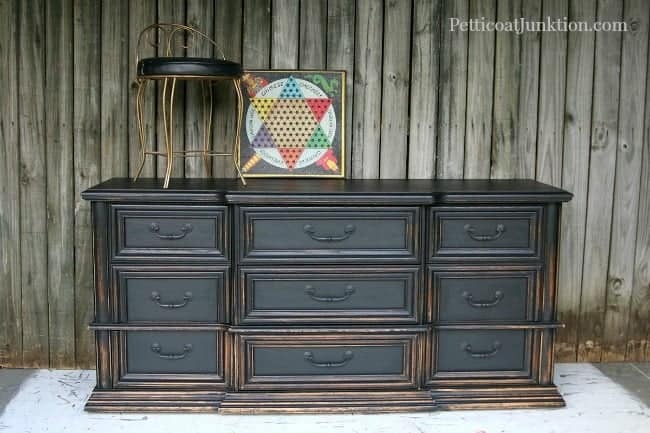 I used a flat black spray paint on the furniture pulls and gave them a little sheen with Miss Mustard Seed’s clear wax. You can tell the ones that haven’t been waxed. I like flat paint but sometimes it needs a little help. Why didn’t I use a satin finish? The satin paint actually has quit a bit of shine and I wanted the pulls to blend in instead of making a statement. The pulls are original to the dresser. I did all of the distressing by hand because I wanted more control than what I have with a power sander. 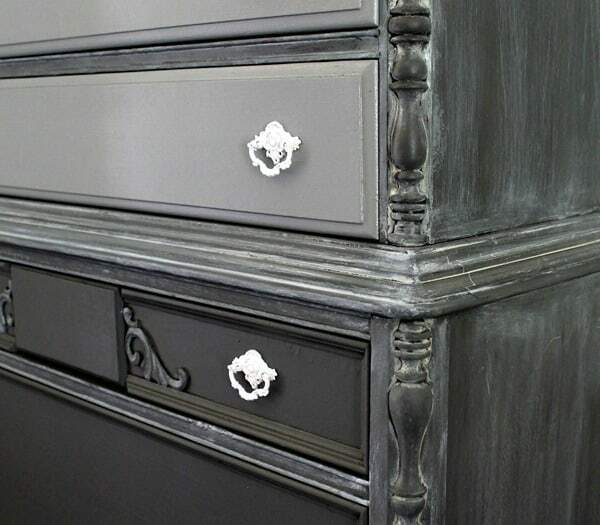 I distressed the bottom really heavily and eased up on the distressing as I got closer to the top of the dresser. Just like the inspiration piece. The paint is Reclaim Beyond Paint in licorice. I would not have thought to do the graduated distressing. When I saw the Pottery Barn piece several months ago I knew I would eventually try the technique. 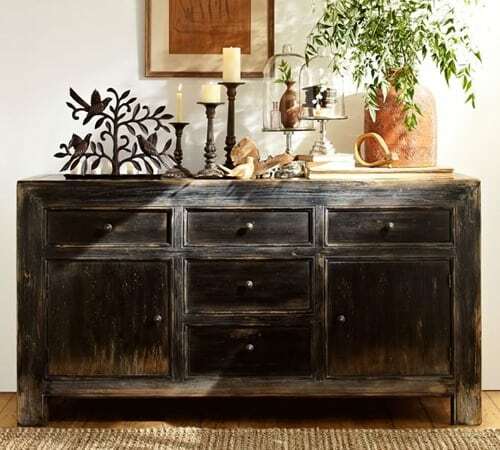 I love Pottery Barn furniture but it’s out of my price range. Update: This piece made the top ten list. 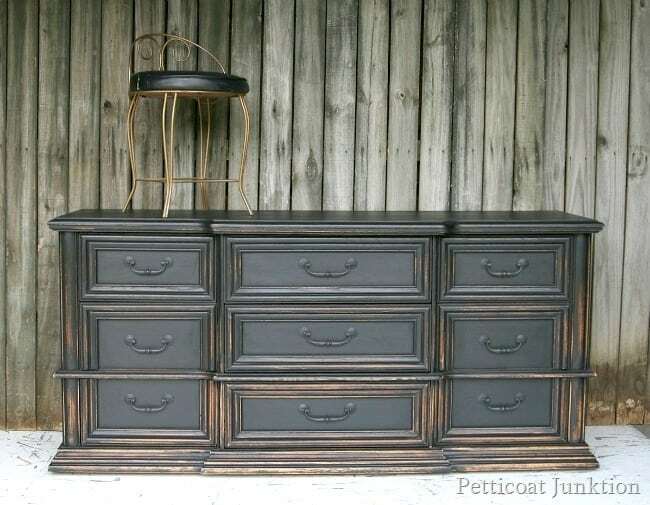 See it here…..Top Ten Furniture Tutorials. I’m off to check out the other makeovers…just click the photo links below and join me. Kathy the bureau is beautiful. I have a few questions though (I’m new to DIY furniture) You said you prepped the dresser.. My dresser definitely has a varnish or shiny coat, do I have to remove that? or sand? 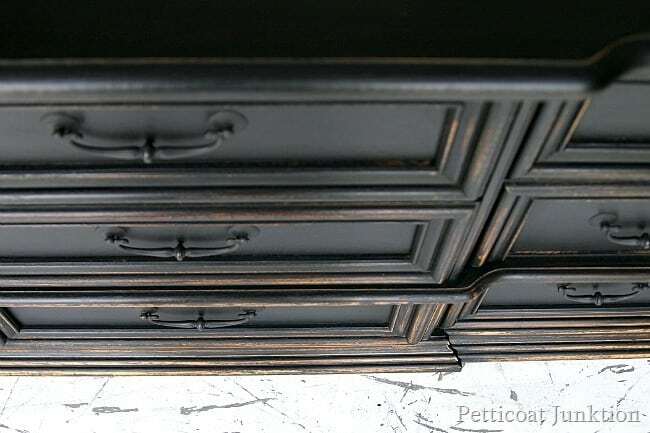 or does this paint (like chalk paint) eliminate that step? Did it require more than 1 coat? What was your process for distressing? a rag while still wet? Thank you so much for this tutorial.. just gorgeous! Sherri, The Reclaim paint doesn’t require any primer or sanding before hand. 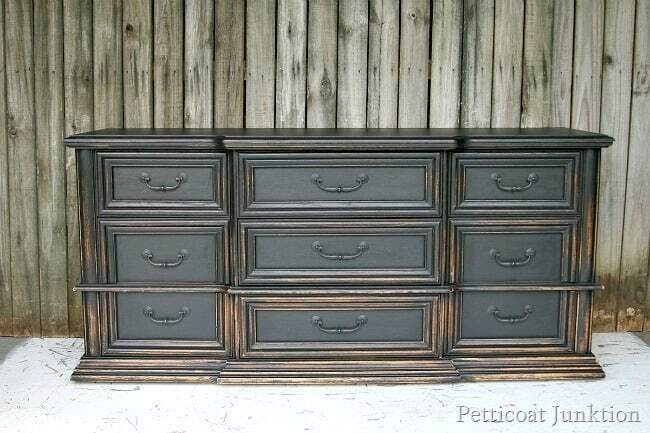 I distressed the dresser by hand using I think 100 grit sandpaper. I would suggest using something 80-120 grit. I waited until the paint was dry to distress. Thanks for the nice comment. Omg! 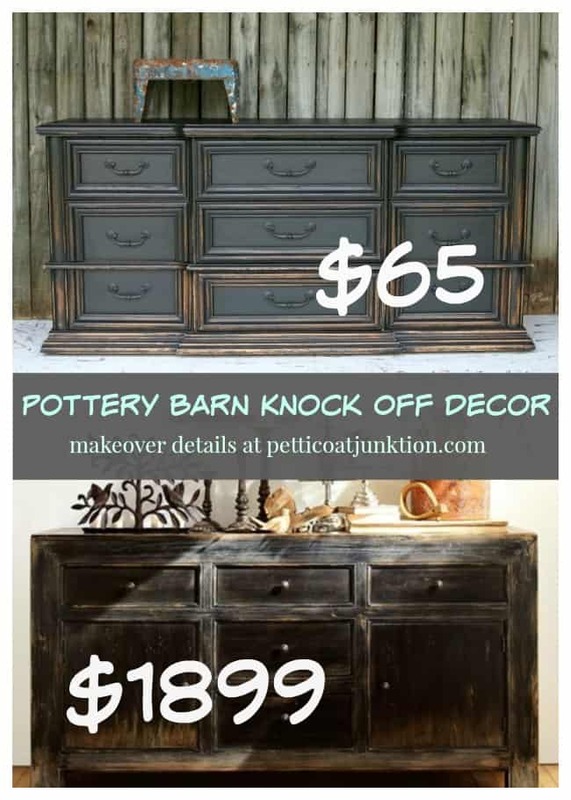 I LOVE,LOVE,LOVE the pottery barn knock off YOU did! I need it in my life! Yours was twice as nice as the PB original. As a rule I don’t like most painted wood pieces but this one is absolutely gorgeous. Congrats and enjoy that beautiful piece. That’s a beauty Kathy!!! You did a great job! Great job Kathy. I actually like yours better than theirs. Their version is just a bit too rustic for me and yours is just right. And the price is great! Have a great weekend at the CL fair! kathy is the Reclaim paint sold at You Never Know in Clarksville? And does it have to be waxed? Love the finished piece. Lynne, It is sold at You Never Know and it does not have to be waxed. It is a primer,sealer,paint. all in one. Love this Kathy, it’s beautiful! It’s like it has an ombre effect with the distressing which is so cool! This is so high end looking. Love the color. Great knockoff, my friend! On this one.. you knocked it out of the ballpark and I have to tell you I seriously love your piece MUCH better than the original! Great job!! Lovely Kathy. Black is great and you did an amazing job. 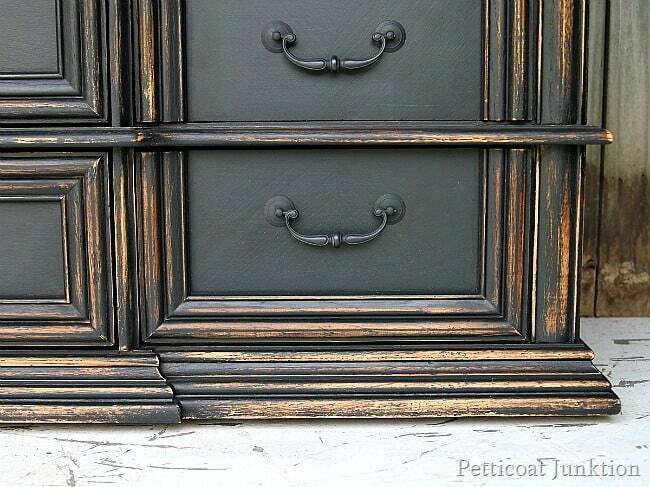 My absolute all-time favorite PB finish is with the black distressing. As always your version is stunning! Wow Kathy! 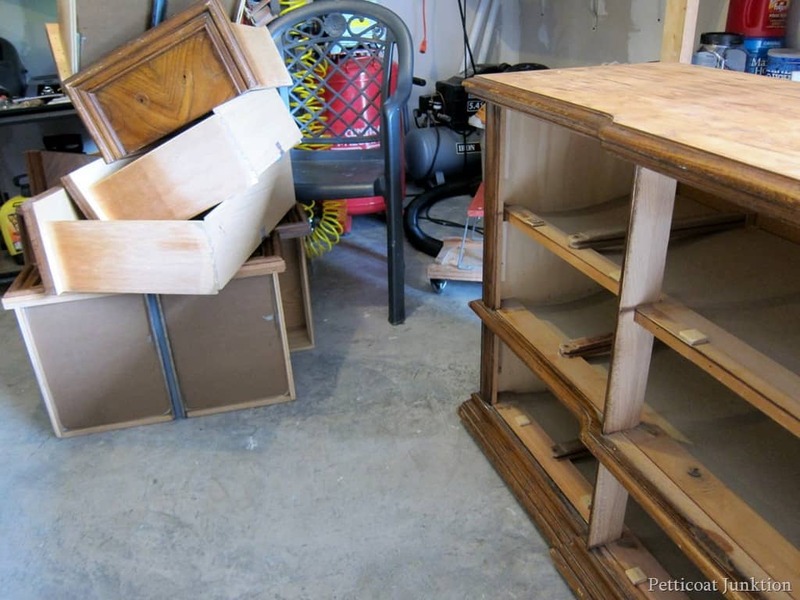 This looks like a whole new dresser! I really need to be able to have a better vision when it comes to dressers. I don’t think I would have given this a second look in the before state and now its gorgeous! 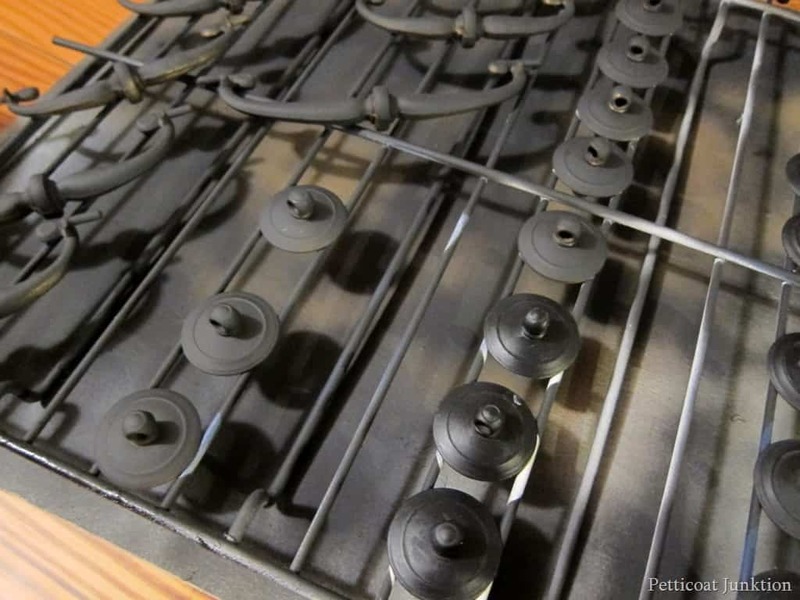 And I’m so stealing your cookie rack used as a hardware spay station…I love that idea! Ha ha that would be “spray” not spay lol! Unbelievable, what talent you have. That is just beautiful Now I have to find a wooden piece to refinish Thanks for sharing . It looks very nice! Makes me want to do something similar to a piece. I love how you distressed this piece. I’ll have to say that I like your version better than the PB one and I definitely like your price better. Thanks Paula, I like my version better too! The price is certainly better! Did I miss what paint and color you used on this dresser?? I did forget it Vicki. Thanks for pointing that out. I will add it to the post. It is Reclaim paint in Licorice. Hmmm, gradient distressing, who would’ve thunk it. 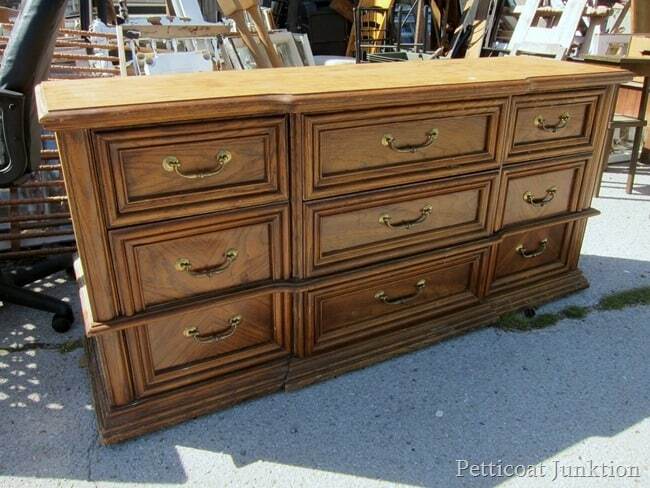 I really like the look of your dresser. Truth be told, I like it better than the original. OH my, Kathy, that is gorgeous! You are crazy talented. I love that gradient distressing. Your blog is my favorite! I love everything you do. Can’t wait to check out your latest ideas. Thanks! I love this piece, you did a GREAT job on it!